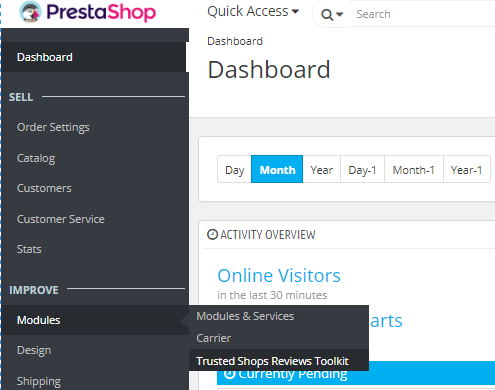 Please open your PrestaShop backend and go to Module >> Front-Office-functions das Trusted Shops Reviews Toolkit and click on install. Alternatively you can download the module from PrestaShop Addons Marketplace“ and manually install it in the backoffice of PrestaShop. Go to Modules>>Trusted Shops Reviews Toolkit. With version 1.6 the module is at the end of the menu bar. If you are updating from a previous version of the module, this step is omitted because the association is automatically adopted. After you have logged in with your "My Trusted Shops" data, you will be redirected to the "Configure my shops" page. Here is a list of the Trusted Shops IDs you have booked. By clicking on "Edit" you will get to the page "Configure your Trusted Shops-IDs". Here you can associate the Trusted Shops ID with a shop using the field "PrestaShop Shop Language". After you have associated your Trusted Shops ID with your shop and saved, you will be redirected to the "Home" page. The "Home" page gives you information about which Trusted Shops products you have configured in your module. 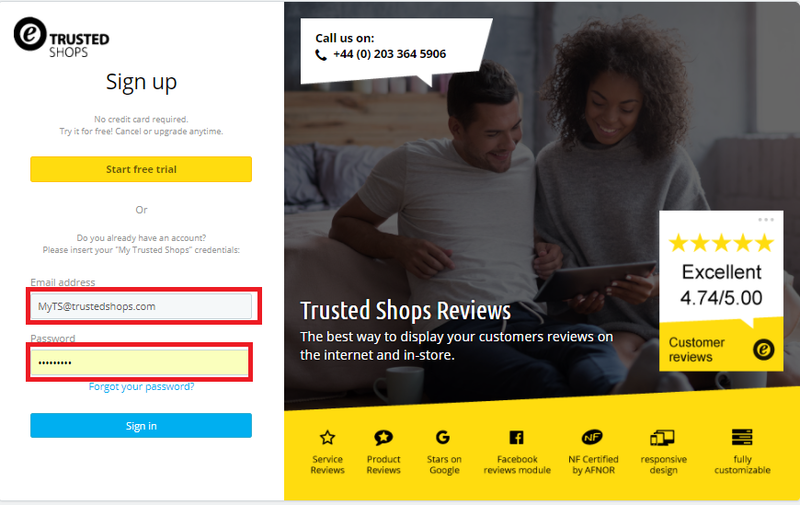 To display the Trustbadge on all pages of the shop, go to "Trusted Shops Reviews Toolkit" on "Service Reviews". Here, select "Show Trustbadge on all pages" YES. Afterwards, further settings for the configuration of the Trustbadge will be displayed. You can e.g. display the Trustbadge without rating stars or change the distance from the lower right corner with "Vertical distance". For further configuration options, you can activate the expert mode. If you want to use Trusted Shops product Reviews and have booked an appropriate package, you can activate this under "Product Reviews". The new PrestaShop Trusted Shops Plugin carries of a lot of new functions. You can now send review requests for orders made in the past 6 months. Alternatively, you can activate the "Automated Invites According to PrestaShop Status" function, which allows you to decide which order status and in what time frame your invites are sent. The detailed help page gives you a better understanding of all new functions.